Matsapha (Swaziland) (AFP) - Six months before Swaziland was cut from a crucial trade deal that allowed it to export products to the United States duty-free, textile worker Maria Matsebula fell to her knees in front of King Mswati III. She begged him to make the political reforms necessary to keep the small southern African kingdom in the deal. "As workers we understood that the king has all the power," said Matsebula of the last absolute monarch in Africa. "So we turned to him as king and as our leader to salvage the situation." A year later, Matsebula is one of thousands of textile workers out of a job after Swaziland failed to meet a string of labour and political reforms demanded by the United States in exchange for continued favourable trading conditions under the African Growth and Opportunity Act (AGOA). "We saw a massive loss of jobs, particularly by our workers in the textile sector," said Vincent Ncongwane, secretary general of the Trade Union Congress of Swaziland. Since the country dropped out of AGOA in January, unions say more than 3,000 have been thrown out of work -- against the government's more conservative estimate of 1,800. In a country of just 1.27 million people, already battling 28.5 percent unemployment and with 63 percent living below the poverty line, Ncongwane said the government had no idea of the scale of the knock-on effects. 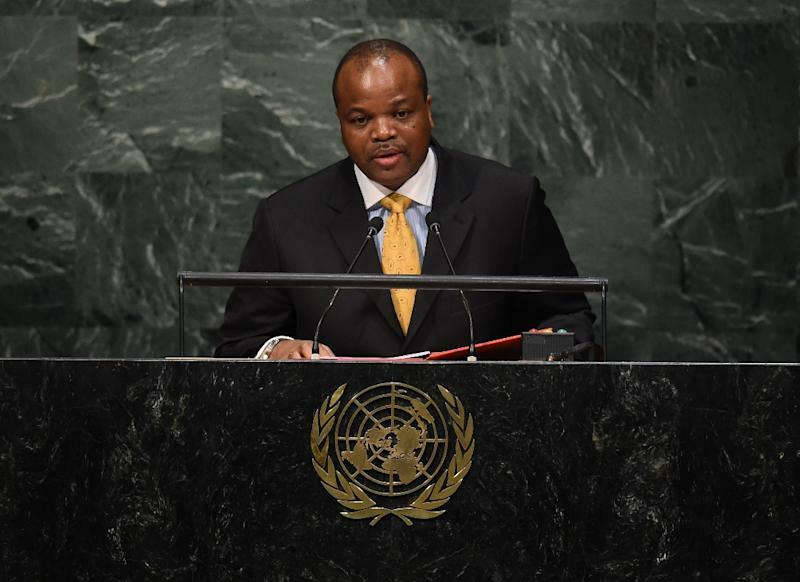 But Trade Minister Gideon Dlamini said Swaziland has coped well with the US decision. "The sector that was driving employment was mainly textile, and so we thought -- let us begin to diversify and develop other sectors," he told AFP. "We just woke up to say, let us think differently -- not put all our eggs in one basket." It is a tactic the government claims has already created 1,500 new jobs -- although it has provided no details. Swaziland's textile industry employed 30,000 workers at its peak in 2004, according to a 2010 report by the African Cotton and Textile Industries Federation. The federation predicted then that an extension of the AGOA agreement -- which lured many Taiwanese investors -- was "critical to the survival of the apparel and textile sector in Swaziland". Under the agreement, which was signed into law in 2000, some 40 sub-Saharan African countries were granted access to US markets under favourable terms as long as they meet political and economic standards. But the Swazi government, appointed by the king, is regularly accused of stifling dissent, jailing opponents and crushing labour protests. In September last year, Thobile Gwebu collapsed and was rushed to hospital for an emergency Caesarian section after a gas leak at a factory. She returned from hospital to discover she had been made redundant. "They closed their gate on me," she said from her mother-in-law's village two hours from the industrial centre Matsapha, her now one-year-old daughter clambering over her lap. "I wasn't even allowed to argue my case." Despite doctors' requests, the factory never revealed what chemical Gwebu inhaled, and a year later she continues to battle chest pains, shortness of breath and dizziness. "We have a government that assists employers in any way to destabilise the trade union movement in Swaziland," said Wander Mkhonza, secretary general for Amalgamated Trade Union of Swaziland and a former sewing machinist. "It is the workers' right to organise, to strike if they are not happy with what their employer's offering. "But in Swaziland, when workers strike, the government sends in police to beat them up and tell them to return to work." When labour and civil society leaders travelled to a summit in Washington last year, Prime Minister Barnabas Dlamini called for them to be "strangled". He later retracted the statement. "For us, this is a temporary situation," said trade minister Dlamini, who insisted the government was still working on meeting the US demands. "And we want to believe that is how the Americans are taking it: that once we address all the benchmarks we'll be readmitted to AGOA." But without serious reform, the tiny kingdom could face more trade trouble. In August, the European Parliament passed a resolution warning Swaziland to take concrete steps to improve its human rights track record or risk losing trade incentives -- a threat now hanging over the country's top export, sugar. Without work for months after her failed plea to the king, Maria Matsebula is still unemployed, her $740 severance pay all but spent on her six-year-old daughter's school fees. "Other factories still operating don't want to hire some of us who were in unions," she says. "The constitution says every worker has a right to be organised, but employers don't want us."